Instructions for creating antiqued finishes abound on the internet- and in my quest for a really authentic antiqued/patinaed finish, I tried a bunch of them. Through trial and error using other tutorials, plus some old secrets from the copper-smith shop where I grew up, I developed this method for antiquing that creates a metallic old-gold finish, using a thin coat of high quality acrylic paint rubbed into crevices to create a faux dirty antique finish that softens the metallic gold with a vintage, slightly grungy feel. Here’s my technique, start to finish. Share your results in the comments below! A box or trash can where you can toss paint-soaked paper towels. 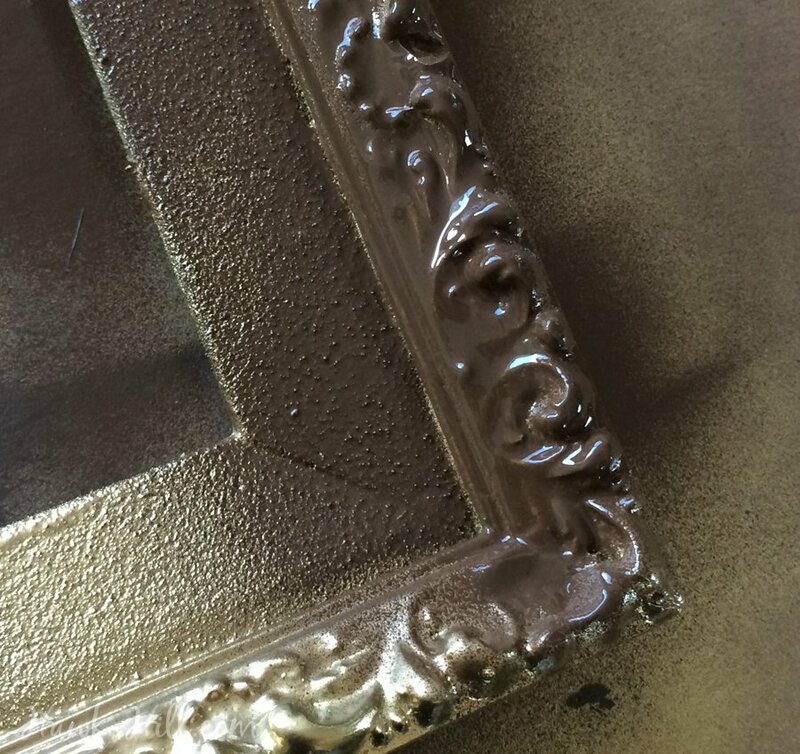 Paint frames with gold foil spray paint, taking care to cover top and sides evenly. I usually paint on my driveway on top of cardboard boxes. The cardboard boxes protect permanent surfaces from overspray and lift the frames I’m painting up a bit so the process doesn’t require constant bending over. 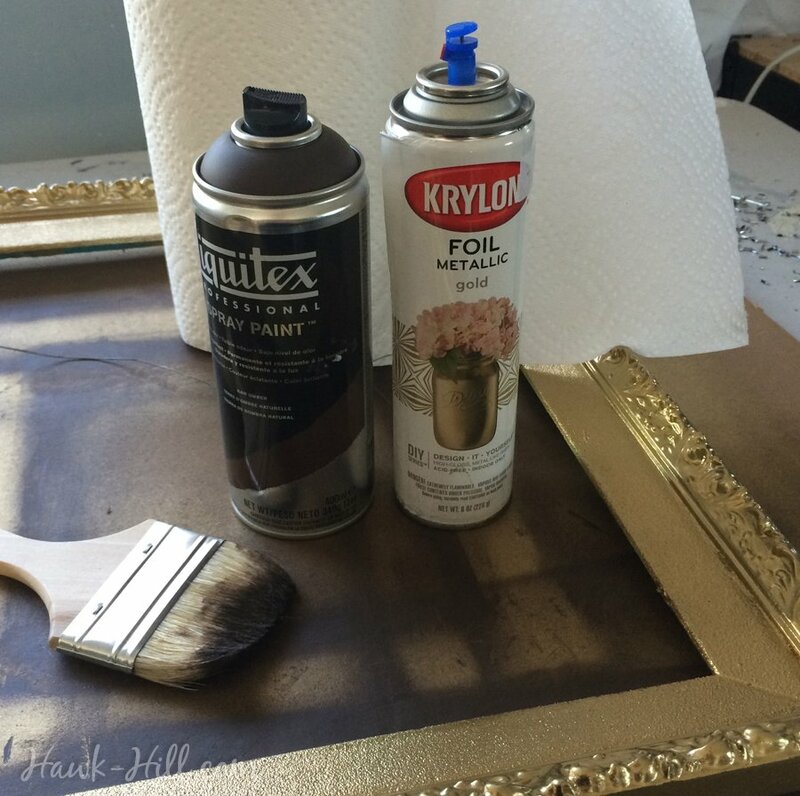 I like the foil spray paint because it’s the best for replicating a real gold brilliance, not just a “gold color”. 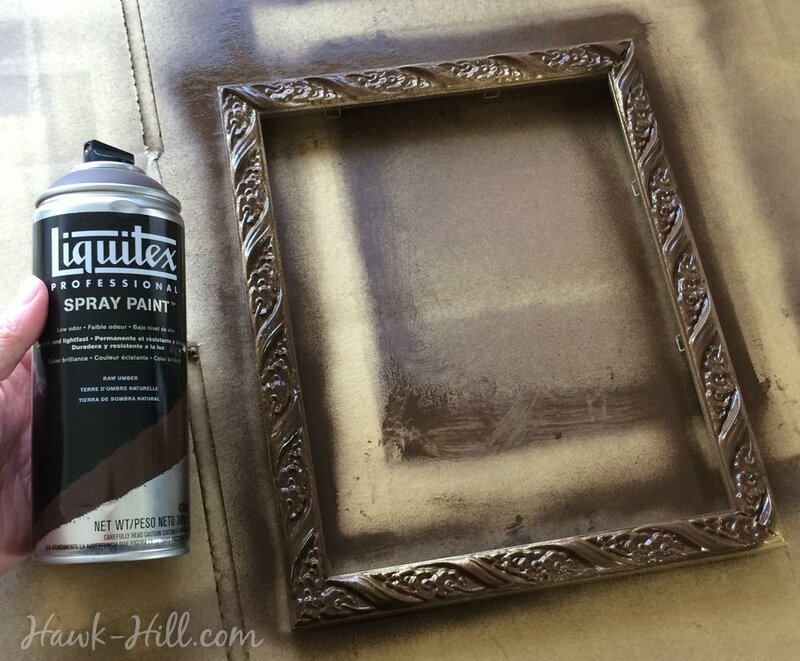 Once the gold paint is completely dry (wait a minimum of an hour or two) add a thin coat of the Liquitex Professional Spray Paint – Burnt Umber, as shown. Notice I did NOT say “brown spray paint” friends. Trust me. I’m a penny pincher, I’ve tried the thrifty route for you and resorted to this artist’s grade paint. It makes a HUGE difference. The “burnt umber” is the perfect tone of brown for creating the authenticity we’re going for and the artist grade pigments in this spray paint make a huge difference. Rather than the typical milky-texture of spraypaint, this stuff goes on sort of thick and buttery- but very evenly. 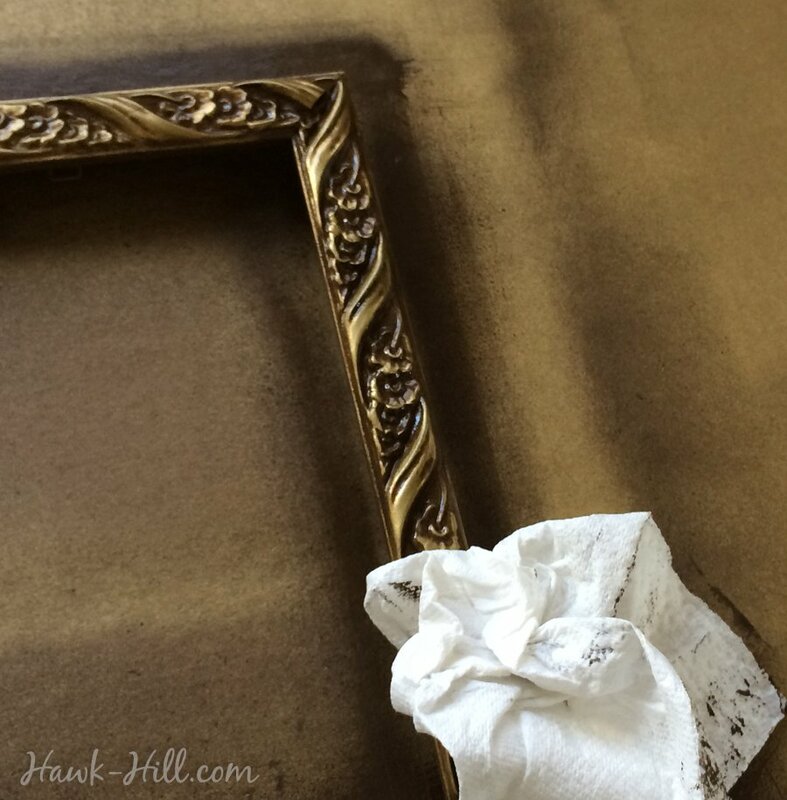 Now that the brown paint is worked into crevices, you’ll need to remove paint from the high points of the frame- like edges and ridges. To make your patina less obvious, rub a little more aggressively, clearing more of the brown paint from the crevices. That’s all it takes! 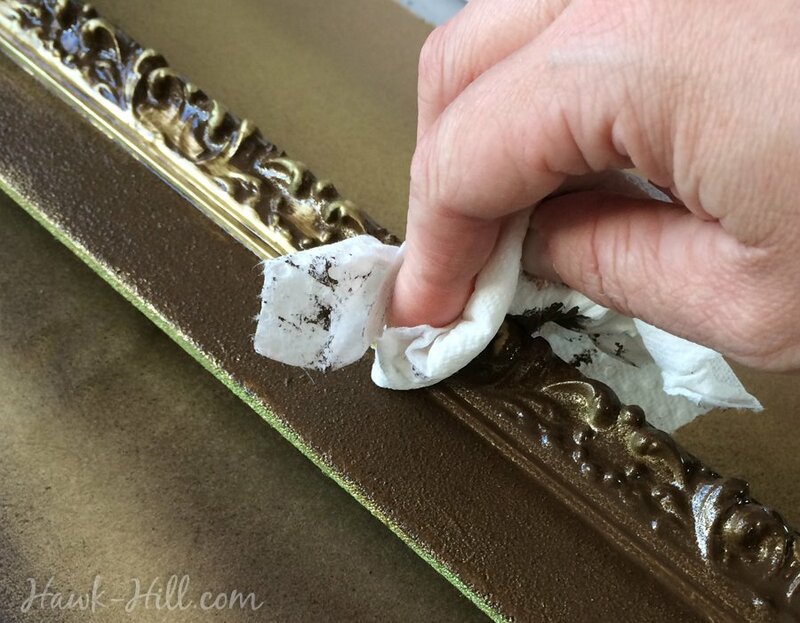 As you can see from the close-up photos, the final effect is a rich, vintage, expensive-looking finish that you can add to dollar store frames and thrift store finds. 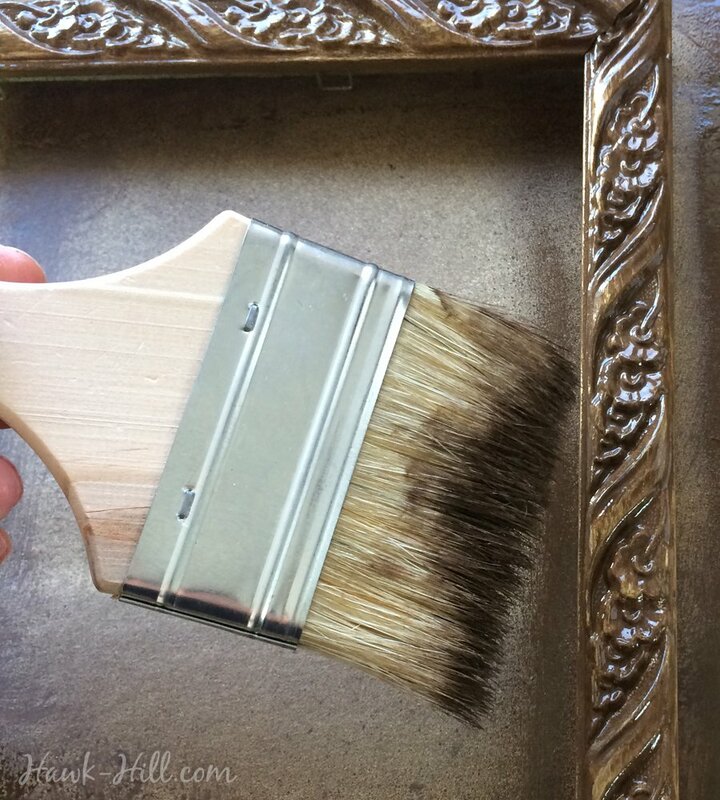 The more texture and recesses a frame has, the better this technique tends to turn out. 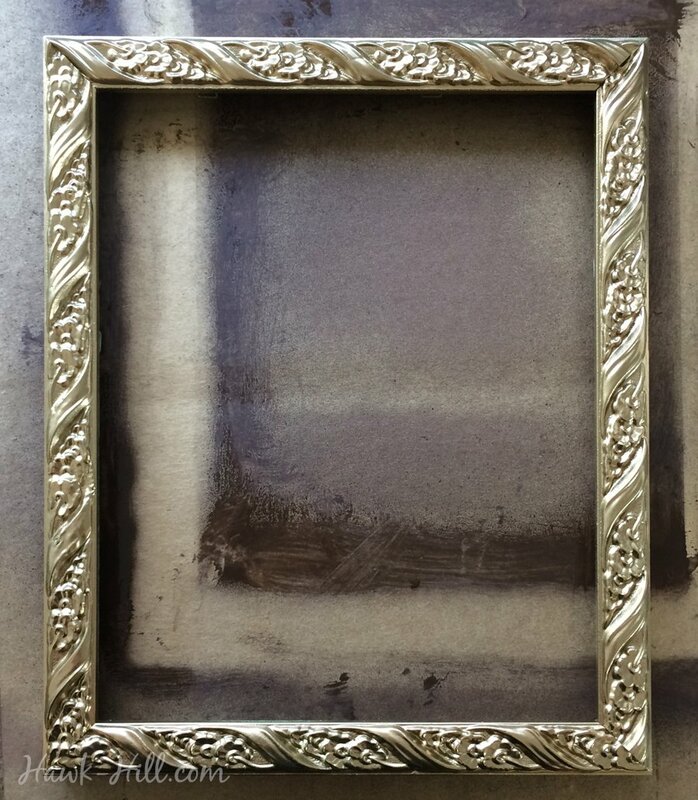 Simple, flat frames can still be made a little more aged and elegant looking with this painting method, but the highly ornate style frames explode with depth and interested with the multiple layers of paint and distressing. 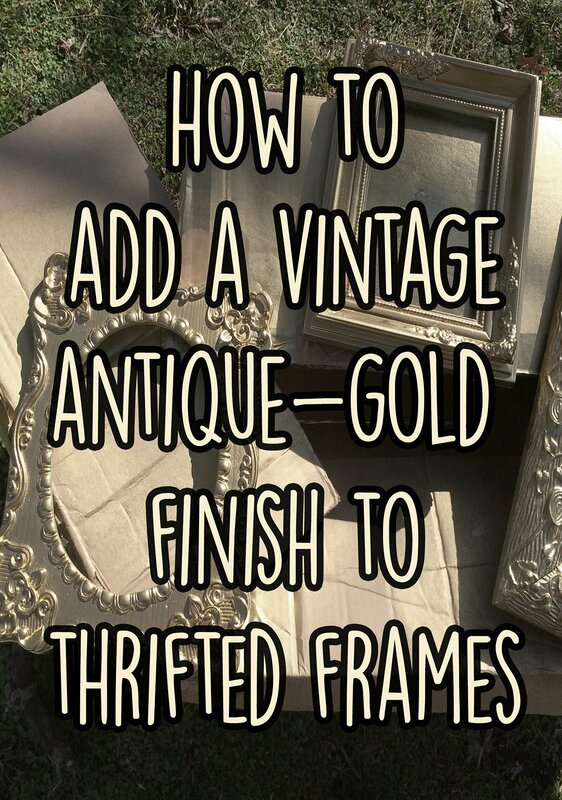 If you love gold it can be tempting to create a wall of all gold frames, however balancing antiqued gold frames with vintage frames in other colors- perhaps containing gold accents within the framed image/object, creates variety and interest on your wall. I loved all the ideas. Especially removing rust. 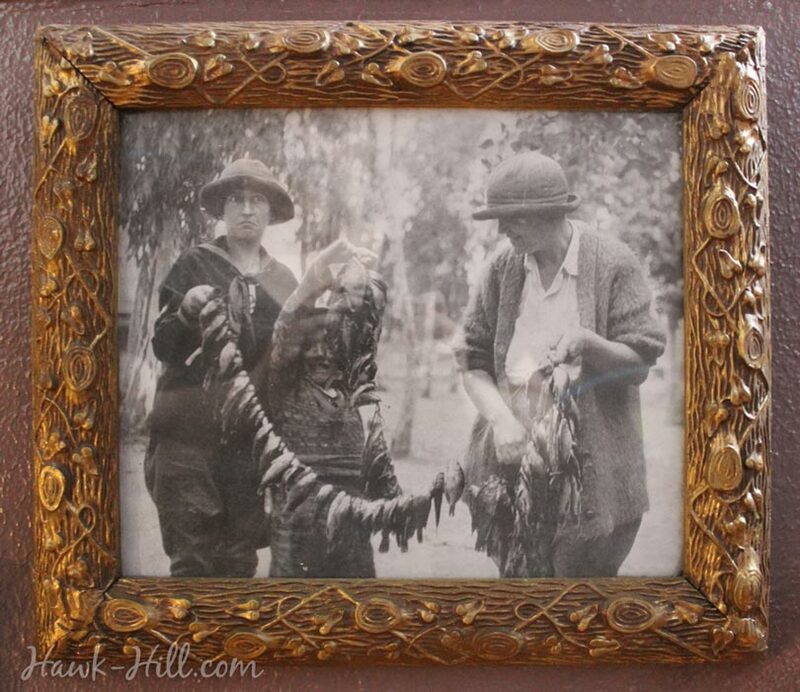 My dad was a blacksmith and I have forge tools that are rusted and want to clean and display them. Thank you so much! Hi, I just wanted to double check the brown spray paint! Your link goes to a Burnt Sienna, your post says Burnt Umber, but the picture of the can of spray paint says Raw Umber haha. SO glad you checked! 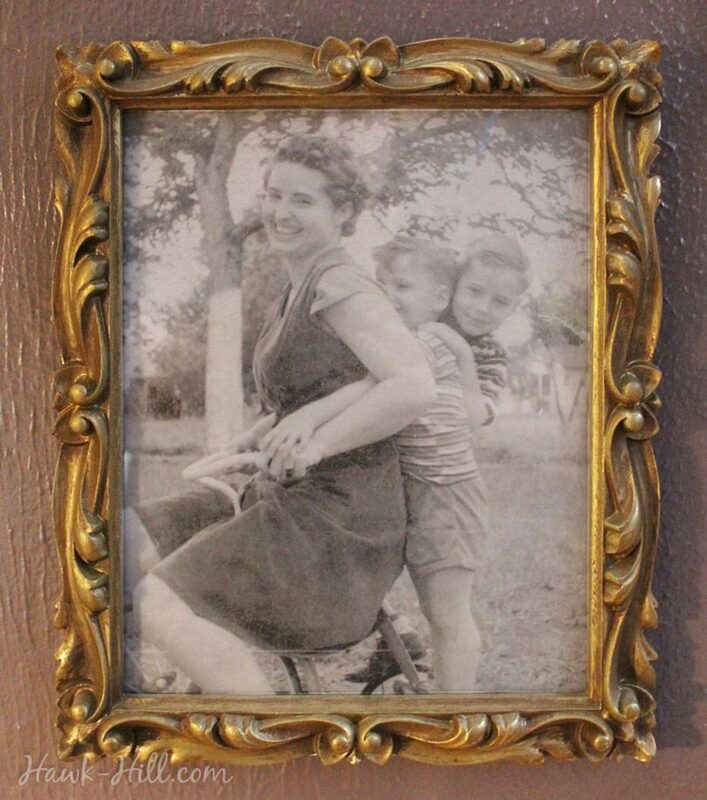 I remember feeling these frames were a bit more reddish-hued than I liked, so recommend the one I linked- Burnt Sienna (but any medium/dark brown should work). I think for this project the viscosity of the paint plays a bigger role in success than the color.